Description of "Between You & Me "
You have worked so hard to acheive all that you were supposed but yet there is a void. Do you have questions that you don’t know who or how to ask? Do you feel like there might be ‘something more’? Has the search for your life’s purpose left you feeling pointless? Then the fact that you are holding this book right now may not be totally coincidental. Come join us for a conversation over a cup of tea … this is going to get interesting! Born and raised in India, Priyanka developed a unique perspective on life from the confluence of the traditions of India and the freedom of thinking that America fostered. Add in an engineering degree, a career in business consulting and energy healing work to the mix – her life is her favorite laboratory! She blogs about her perspectives and writes poetry to fill in the gaps of the day. She lives with her husband Nitesh and their son Nirvaan in Chicago, IL. The Sage and the Scientist by P.V.S.SURYANARAYANA RAJU. 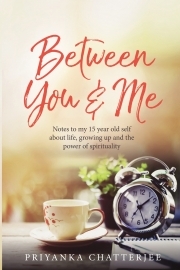 Reviews of "Between You & Me "